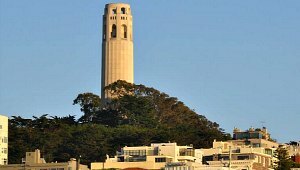 Coit Tower in San Francisco offers terrific views of the downtown area, Fisherman’s Wharf and bay. It stands on Telegraph Hill, at a height of 210 feet and you can see it around large parts of San Francisco. When you look at it from a distance, you can see that it resembles a fire hose and there’s a very good reason for this. The tower is a piece of history in itself, having been constructed back in 1933 with a donation from a wealthy resident who was a big supporter of San Francisco fire fighters. Inside there is a shop and some impressive art murals on the walls. The biggest hiccup for your trip to Coit Tower will be the San Francisco weather. It can change dramatically in a short space of time, obscuring your view! So, make sure you go on a clear day. One other thing to bear in mind, the tower isn’t particularly near any of the main tourist sights, so you need to think how you’re going to get there. We walked from Fisherman’s Wharf, but it is a long trek uphill. Alternatively the number 39 MUNI bus service from Pier 39 stops at Coit Tower. However you choose to get there though, the view is definitely worth it! Coit Tower is open daily from 10am, but closing time depends on the time of year ranging from 5pm in the winter to 7pm in the summer. Admission to the first floor is free but the elevator fee to go higher is currently $4.50 for adults (2012 prices).